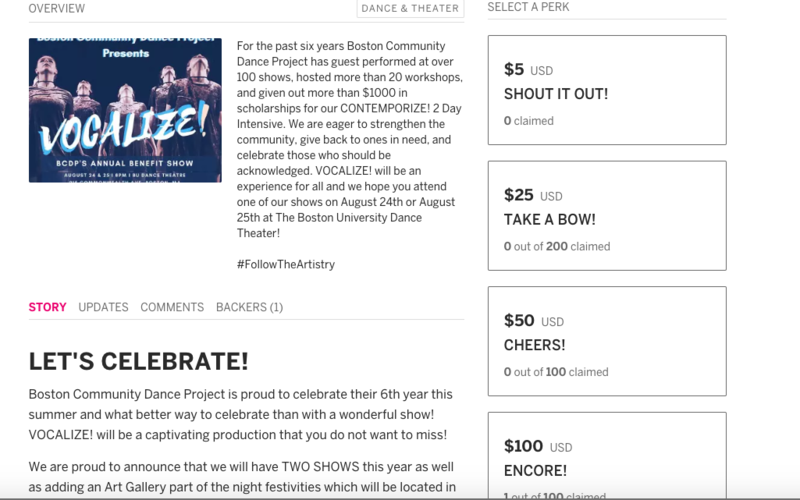 If you are an advocate for the arts and want to keep the celebration of movement alive, donating to BCDP is the perfect way to do so. Just as each company member donates their time and ability to various organizations, we hope you will be able to do participate in an ongoing cycle to help the Boston community. Not only is dance a passion for our local artists, but it is also a form of therapy and release for our audience members. BCDP aims to present movement that is relatable and can ignite a deep connection with our viewers. Please consider donating to our company to ensure that this healthy form of human development and awareness stays present in the Boston area. One of the most effective ways to show your love for BCDP is by donating to our annual Indiegogo campaign. The money that BCDP earns from this funds our Summer show in August. It supplies the costumes, theatre, staff, and all of the behind the scenes action that is necessary to create a full length show! Along with supporting our production, a portion of the proceeds will be donated to an outside charity. This year BCDP donated to "The Expression Project (projeX)." It is a nonprofit organization that raises awareness for Multiple Sclerosis. To learn more, visit their website. Each Summer, BCDP launches a new Indiegogo. Check back in a few months to learn about how you can contribute. We appreciate our supporters.